fullhyd.com is more useful that you would expect of even an advanced local guide. Here's where to look for help with features. For most categories of places - e. g. restaurants, educational institutions, cinema halls - fullhyd.com gives distances. Where are these distances from? If you do not know the answer to the above question, then they are from Nampally railway station, which fullhyd.com considers the default center of the city. If you wish to change that to the place you are at, here's how to do it. 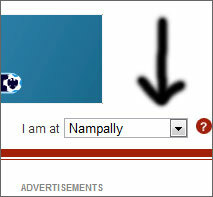 At the top of every fullhyd.com page, you will find a dropdown box labelled "I am at" (please see figure by the side). Click on the dropdown button, and you will see a list of pre-determined locations. You can set any one of them - they represent a central place in that location. 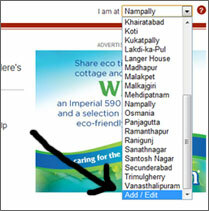 For example, Nampally there (which is set by default) stands for the Nampally railway station. Click on the location you wish to set. The page will refresh after you change a location. fullhyd.com also allows you to create your own locations. Click on the "Add / Edit" option (see figure), and you will be taken to a screen that will help you select your own location. In locations that have a "Maps and Directions" tab (e. g. this), you will find at the bottom of the screen, a block called "Set This As My Location" (please see figure). You can use that to set that place as your location, too. You will need to be a signed up user to set custom locations. fullhyd.com has amongst the simplest signing up processes anywhere. At this time, the global fullhyd.com search (that you see on the top of every page), searches events, discounts, movies and locations if you do not specify a category (i. e., the right side dropdown shows "All"). It is always better to specify a category, to avoid an interim screen that asks you to choose a category if fullhyd.com find results in multiple categories. The global fullhyd.com search does not search discussions, blogs, personals, articles, images and roundups. The former 3 have their own search, and the latter, we are working on. We are also working to integrate all search. If you want to search in more fields (user reviews, names of users who posted reviews, the editorial review etc. 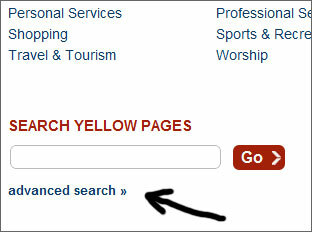 ), and order/filter your results better, you can use advanced search. The advanced search link appears along with the results of a search, at the bottom of the page (please see image). At this time, fullhyd.com does not accept spelling mistakes, so please try again if results aren't satisfactory. We are working on this. You can also look for results only in a specific category - please click on the appropriate link in "FILTER" in the grey strip to the right of the results. Click on the category you are looking for, and fullhyd.com will show results for your search only in that category. You can further refine into subcategories in the next screen. 4. Monitor your activity on fullhyd.com - ratings and posts you made, advertising credit you have earned etc. When you save any search result on fullhyd.com (an event, a location, a movie etc. ), it goes to your My fullhyd account. So if you found an interesting baby care center near your home but do not want to scribble the details on paper, you can send them to your My fullhyd account by saving the location (you can jot down notes, too). fullhyd.com has perhaps the world's fastest signup - if you want to rate/review an event or location or movie, your account gets created without your even leaving that page. We need email verification, but we let you review without you having to first verify your email. We give you a day to confirm your email (you'll need to click on a link we send to the email). If you do not, all posts and ratings made by you are deleted, and your account terminated. If you forget your password, please click here. To change your password, click here. fullhyd.com never reveals who you are unless you wish to do so yourself. So whether it is on the discussion forums, the blogs or posts reviewing events/locations/movies/sales, you get to set whatever name you want for a post, even though you have logged in. ...and you can do more. fullhyd.com keeps improving, so keep checking this page.